For this weekend I just couldn't decide what I was in the mood to watch. So I decided I wouldn't evenb bother putting any type of theme to the marathon. I will just watch whatever movie the mood hits for. Except of course for horror... as I am still not allowed to watch any of my horror movies yet. I normally give a list of movies that I could watch for this marathon. But of course in this case... that is just not possible. But if you want to check out my collection to request a review (Remember... Non-Horror Please)... feel free to check out my DVD Collection HERE and find something to request. While I couldn't promise... I will try to fit it in at some point during the weekend. 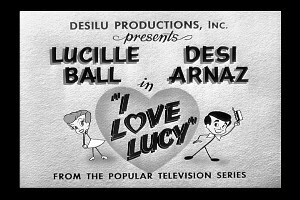 The I Love Lucy movie consisted of three first season episodes (”The Benefit,” “Breaking the Lease,” and “The Ballet”) combined with new footage to make a cohesive story. The film was directed by Edward Sedgewick (an old friend of Ball’s from her MGM days) and gives the viewer a taste of what it would have been like to attend the filming of the show. While this is not the way I would have preferred an I Love Lucy film made... it is definitely an entertaining movie. Though anyone that knows the series will know what to expect from the movie since it is 3 season 1 episodes combined to make the movie. But it was interesting to see the added scenes to make the 3 stories into one long story. This is the first time I ever seen this movie version. It is worth checking out... though I would recommend not watching it shortly after watching season 1 of the series. 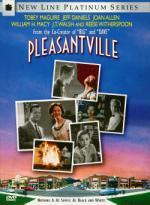 When '90's teens David and Jennifer (Tobey Maguire, The Ice Storm, Reese Witherspoon, Freeway) get zapped into the perfect suburbia of the black & white '50's sitcom, Pleasantville, what results is a "visionary adventure" (Peter Travers, Rolling Stone) that Siskel and Ebert give "Two big thumbs up!" Pleasantville's perfect people include a mild-mannered soda jerk (Jeff Daniels, Dumb and Dumber), a socially repressed mom (Joan Allen, Face/Off) and a father who always knows best (William H. Macy, Fargo). But, when '90's pop culture clashes with '50's family values, chaos ensues, turning the town of Pleasantville upside down and black and white into color. It has been a very long time since I watched this movie. I last watched it right after I bought it back in 2003. I liked the cast in this one... but the story could have been better. This movie stars Toby McGuire... someone that I really didn't know until he did the Spider-Man movies. I did find this movie enjoyable for what it was... but I just feel like there was something missing from it. Something I just can't put my finger on. I must admit I did get a kick out of seeing Don Knotts as the TV Repairman. 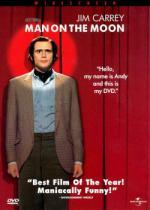 Based on a true story, Jim Carrey stunningly portrays the late Andy Kaufman - considered the most innovative, eccentric and enigmatic comic of his time - in Man on the Moon. "Jim Carrey is extraordinary," says The New York Post. "Jim Carrey may be a better Andy Kaufman than Andy Kaufman" writes Newsweek. Also starring Danny DeVito as Kaufman's manager, Courtney Love as the woman Andy falls in love with and Paul Giamatti as his best friend. You'll stand up and cheer for Carrey in one of the year's most entertaining movies! This is a movie that I haven't watched since I originally bought it several years ago. Going into it I really remembered next to nothing about it. I never knew anything of Andy Kaufman beyond his Taxi character. So I personally don't know what to think on how accurate the story of his life is in this movie. The reason I bought this movie is because I like Jim Carrey and because I enjoyed the old sitcom Taxi. I would have liked to seen a bit more scenes on the set of Taxi... but I enjoyed the movie and I think Jim Carrey did an excellent job in the role. I thought he did the Latka character very well. He's the star of the show — but he doesn't know. Jim Carrey wowed critics and audiences alike as unwitting Truman Burbank in this marvel of a movie from director Peter Weir (Witness, Dead Poets Society) about a man whose life is a nonstop TV show. Truman doesn't realize that his quaint hometown is a giant studio set run by a visionary producer/director/creator (Ed Harris), that folks living and working there are Hollywood actors, that even his incessantly bubbly wife is a contract player. Gradually, Truman gets wise. And what he does about his discovery will have you laughing, crying and cheering like few film stories ever have. After the last movie I felt like watching another Jim Carrey movie. This is another one I haven't watched in years. Matter of fact the last time I watched it was when I first got the DVD not long after it's release. Not sure why it took me so long to watch it again... it is a good movie. There really isn't any laugh out loud moments... but I did find it very entertaining all the same. It is an interesting and fun story. This one isn't the zany style of Jim Carrey. This role is more of an everyday type person in an extremely unusual situation. I do wish they stuck with the ending a little longer. I would have liked to seen Truman making his way out more then it showed. But over-all very enjoyable. Glad I finally watched it again. In a way, these are the best sort of endings, Pete. You watch it and you want more. But think about it and whatever comes after can't possibly top what you've seen. Plus, what happens next? You already know. Yeah... I guess... I would have just liked to have seen the reunion of him and the other girl... but it works the way it is. That is for sure. Triplets, Megan, Jessie and Lisa Wyatt have all returned from their summer vacations to discover that their father Jeffrey is getting married to snob Cassie McGuire. When Cassie hires decorator Susan Ever to redecorate their home, the triplets believe Susan is the right woman for their father. The planning begins. After enjoying that DVD set I bought recently with the first two movies in it. I was happy to find this one to watch online. I don't know what it is about these Parent Trap movies.... but I really been enjoying them! If this one was ever to make it onto DVD I would definitely add it to my collection. I liked that this one had (real) triplets in it. It also has the familiar faces of Barry Bostwick (Spin City) and Patricia Richardson (Home Improvement). I was also happy to see that the face that started it all... Hayley Mills... came back for this one as well. I think there were a few of these made with the triplets. At least I seem to remember seeing a few of them. I liked them. According to IMDB the next one has all the same characters as the previous one. Looks like I have some searching to do! Working-class waitress Slim (Jennifer Lopez –The Wedding Planner) thought she was entering a life of domestic bliss when she married Mitch (Billy Campbell – TV's "Once and Again"), the man of her dreams. After the arrival of their first child, her picture perfect life is shattered when she discovers Mitch's hidden possessive dark side, a controlling and abusive alter ego that can turn trust, love and tranquility into terror. Terrified for her child's safety, Slim flees with her daughter. Relentless in his pursuit and enlisting the aid of lethal henchmen, Mitch continually stalks the prey that was once his family. Finally Slim is forced to fight back, engaging Mitch in a physical and psychological battle, showing his that she's had ENOUGH! Jennifer Lopez delivers an electrifying performance as a new breed of action hero in director Michael Apted's (The World is Not Enough) harrowing, high-style thriller hit. I picked this one to watch next because today (July 24th) is Jennifer Lopez's 41st birthday. I enjoyed this movie quite a bit. It has some very good and thrilling moments. I especially enjoyed the way it ended. Everyone in the cast did a great job. I do wish there was some more extras then what we got. Maybe a commentary and/or some deleted scenes would have rounded out the release a little better. I picked this one because today (July 24th) is Lynda Carter's 59th birthday. And she has a somewhat small (a few scenes) part in this movie. I enjoyed this one. It is a pure fun show. Definitely not one you want to think too much about. But fun for leave your brain at the door pop-corn type movie. my favorite line in the movie goes to Lynda Carter when as the principle she is punishing the villains and says... "There's nothing more I can do... I'm not Wonder Woman." I know... a bit cheesy and definitely obvious... but I liked it. I really don't feel up to movies today. Plus I have a mini-marathon for tomorrow planned. So I will end this one here. Ehhh... I enjoyed the others more... but that is taste for you. I just felt it could have been better I guess.